Here's a simple natural way to enhance the quality of sour cherry pie--a secret given to me by Justin Rachid of American Spoon Food. It's called Michelle's Miracle--an intensely concentrated sour cherry syrup made from Montmorency sour cherries. Just add 1 to 2 tablespoons to your cherry pie filling and you'll be astonished by the depth of flavor it provides. Michelle advises that refrigerated or frozen it keeps just about indefinitely. If you cant find sour cherries, or you miss the short season, American Spoon Food's Fruit Perfect Cherries is an ideal substitute, in fact, I've often preferred it to the fresh picked cherries and the reason is the addition of the Michelle's Miracle! My recipe for using the filling is on the jar and just below. Link to My Recipe Cherry Pie Using Fruit Perfect Cherries 2 jars (13.5 ounces each) Fruit Perfect Cherries 1 tablespoon cornstarch (0.3 ounce/9.5 grams) 1 tablespoon water l/4 cup sugar (1.75 ounces/50 grams) Empty the cherries, with their thickened juices, into a medium bowl. In small bowl, stir together the cornstarch and water to dissolve the cornstarch. Gently and evenly stir this mixture into the cherries with the sugar. 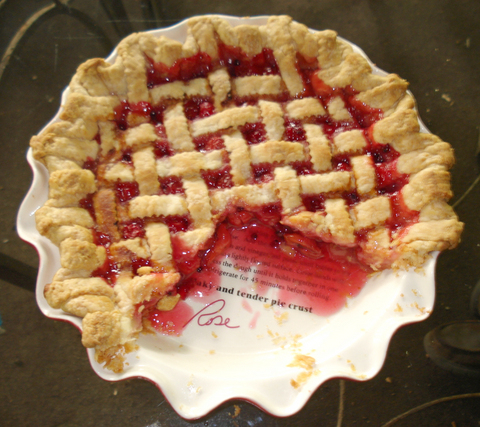 Bake as for Cherry Lattice Pie, but at 400°F/200˚C for 30 to 35 minutes.